I was in Austin visiting family over the weekend so I haven't been cooking much. 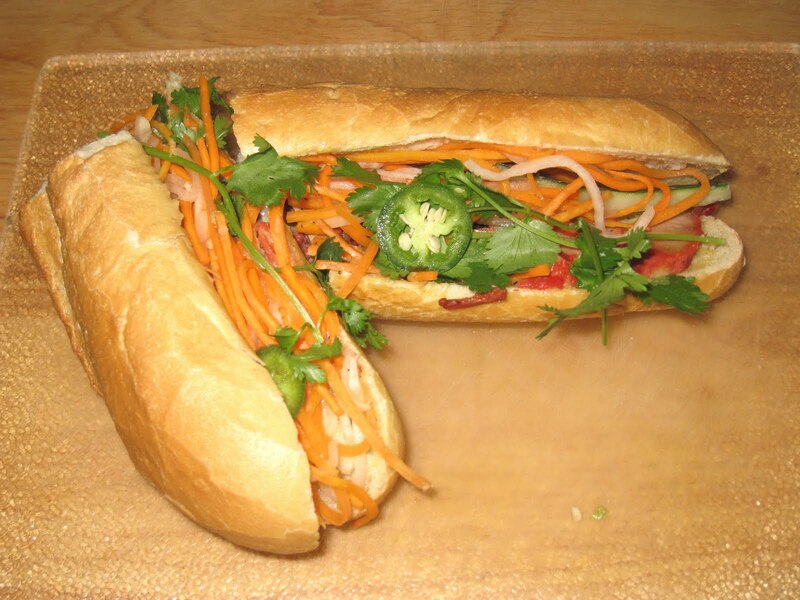 I got home in the afternoon and, rather than having to come up with something as soon as I got home, I decided to splurge on a BBQ Pork banh mi from the Bun Mi Express franchise that recently opened around the corner from my apartment. I have been wanting to try them since they opened in June, and this was the perfect time to visit. I have been somewhat disappointed with most of the Vietnamese sandwiches I have had in Chicago, mostly because of the bread. The crust is thick and chewy, without that signature crunch that yields to the soft, tender bread, and the whole loaf is so thick that I cannot take a bite of the sandwich without the inner ingredients sliding out the other side. There is just too much bread for the sandwich. I have read (but not confirmed) that the bread at Bun Mi Express, while not made at the shop, comes from Montreal and is baked on-site. It is the right size in comparison with the ingredients, and has the right texture and consistency. The crust is thin and crisp, and the interior is soft and tender. The ingredients are all fresh, and they used the perfect ratio of mayonnaise to vegetables to meat. The BBQ pork was sweet and tender, and for this sandwich had just enough fat to enhance the flavor. They had samples of the pork roll on the counter, which was filled with pork and pate and was quite delicious. I will definitely have to go back for more. The sardine sandwich is calling my name. Delicious looking pics! Yummy Yummy!